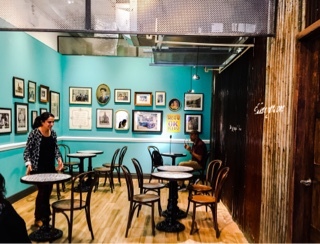 Seema and Amreen Omar’s new permanent location is stunning and inspired by the older Iranian cafes found in Mumbai. 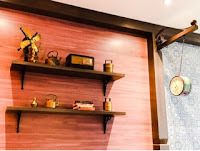 I’ve never visited India, but if the cafes consist of bright airy spaces, a mix of beautiful patterns and motifs, interesting trinkets sitting on shelves and ornate light fixtures, I can see why they want to bring this laid back vibe to Toronto. Bombay Street Food started as a travelling eatery in 2014, served in farmers’ markets and festivals across the city. 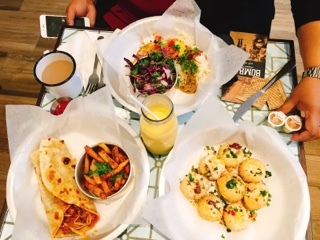 The pair were offering smaller street food dishes inspired by what’s found in Mumbai, where diners mix and match offerings to make a meal. They were a hit and attendees kept asking for more, until finally this May the sister-in-laws quit their corporate jobs to dedicate themselves fully to the restaurant. 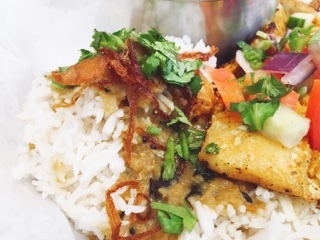 Not to leave their roots, Bombay Street Food continues to source much of their produce from farmers’ markets (hence the vegetables in the salads and vegetarian dishes changes with what’s in season). They also want to follow tradition by concocting their own spice mixtures and using 100% halal meat. 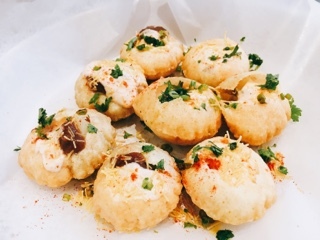 A chaat is essentially a savoury snack that’s found on street stalls across India. With three types on the menu, we shared the dahi puri ($7.95), a thin deep fried bread with a cracker’s texture, filled with stewed potatos & lentils, and topped with cooling yoghurts & refreshing chutneys. Ideally, order these separately to snack on before returning for the mains, as you’ll want to eat them before the crispy shell gets soggy. 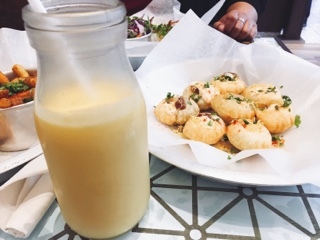 The dahi puri went well with the thick mango lassi ($4.95), a yoghurt smoothie blended with mangoes; I appreciated that Bombay’s version is left natural and not sugary. 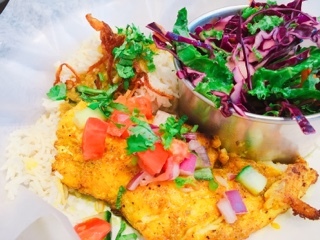 Although the masala haddock ($12.95) had a vibrant yellow hue and smelled amazing, the fish was relatively mild and definitely needed more salt; sadly, there was a disconnect between what I saw and tasted. Nonetheless, the broiled fish was cooked well retaining a flaky moistness and there was enough flavours in the daal chawal rice that it was an enjoyable meal. The daal chawal is fantastic and of the three sides the most unique and delicious. I loved the soft lentil stew topping the basmati, spices and herbs mixed throughout and the intensely caramelized onions on top. The gunpowder fries were also good with the hit of spice that lightly lingers, but needed to be hotter and crispier. A popular dish at the restaurant is the chicken frankie ($11.95), a juicy mild chicken curry combined with red onion and cabbage for crunch, bits of egg to soak up the juices, and coriander and lemon juice to add a refreshing element. 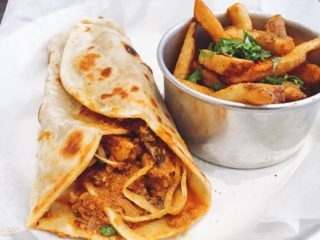 Bombay Street Food makes the roti fresh as an order’s placed so the wrap is chewy and hot with a lovely toasty crunch. It’s good … just close your eyes, take a bite and be prepared for the delicious juices to ensue. And while we’re sitting in a place inspired by Iranian cafes, we had to try their baked goods before leaving – truth be told, the space was just gorgeous and I wanted to sit around longer. Made for people who don’t like overly sweet desserts, the khaari biscuit ($3.95) is flaky and slightly savoury. The layered biscuit is puff pastry without the oiliness. 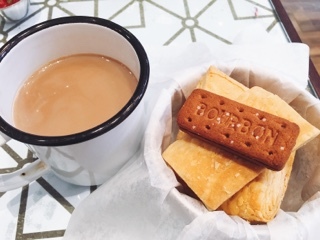 Yet, once it’s dipped in some cutting chai ($3.95), an aromatic tea with cardamom, milk and sugar, the biscuit changes and morphs closer to a dessert. Oh and for those planning a birthday party, bridal shower or engagement festivities: Bombay Street Food is available Sunday for private events. What a great space to use! Just know you’ll also be supporting two fierce entrepreneurs - they’ll likely be at the restaurant, but you’ll also see pictures from their India trip screened onto the wall and framed family portraits in the corner. At last, Seema and Amreen is off the streets and into bricks-and-morter, I’m sure their steadfast supporters are happy. For me, I know where to go for a good frankie with rice. Maybe afterwards I can cozy up in a quiet corner and relax. 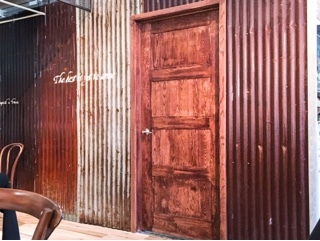 Eating street food has never been so tranquil. Disclaimer: the above meal was complimentary. Rest assured, as noted in the mission statement, I will always provide an honest opinion.